Three new crewmembers are set to join the ISS, and have been making pre-flight preparations in Russia. The astronauts - NASA's Kjell Lindgren, JAXA's Kimiya Yui, and Roscosmo's Oleg Kononenko, are currently in residence in Star City, Russia, near where they will blast off from the Baikonur cosmodrome at 5:02 PM EDT on June 22nd. That's them, on the left. The force (of science) is definitely with them. Kjell Lindgren is a NASA astronaut who graduated from the U.S. Air Force Academy, among other institutions. While at the Academy, he was on the parachute team - an experience he compares to his current job of being a rocket-man, thanks to the intricacy of necessary planning and righteous rush inherent to both. Kimiya Yui is a Japanese astronaut and former military test pilot. After growing up in a small village in Japan and attending the national military academy, he feared his nation's separation of scientific and military endeavors might staunch his boyhood dream of spaceflight. However, after attending test pilot school, he managed to join the JAXA program thanks to his expertise, becoming Japan's first astronaut with a military background. He has also served on the Aquarius underwater facility's NEEMO 16 mission, earning the title of aquanaut. Oleg Kononenko is a cosmonaut who says his "entire life is flying - flying in space." A previous ISS resident two times over, he served as a flight engineer on Expeditions 17 and 30, and commanded the ISS during the subsequent Expedition 31. He has a degree in mechanical engineering and worked closely in the design, testing, and fabrication of spacecraft electrical systems at the Russian Space Agency’s Central Specialized Design Bureau before continuing his space career as a cosmonaut. The three will journey for six hours to reach the ISS via a Soyuz TMA-17M spacecraft. 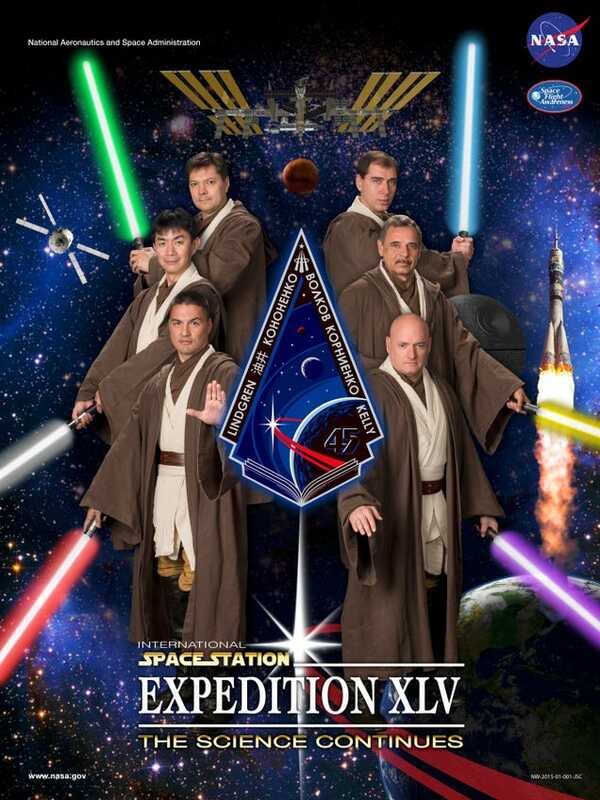 They will spend five months aboard the station. Meanwhile this week, the Expedition 44 crew aboard the station were busy as usual. Astronaut Scott Kelly readied the Japanese Kibo airlock for the deployment of a fleet of Cubesats, which are very small, cube-shaped satellites that operate both independently and as a swarm. He also did work on the Capillary Beverage experiment, which examines how liquid stays in cups that are specially-designed for micro-gravity. The cups' design enables the liquid to cling to the walls of the vessel, rather than float around in globs all over the place. This experiment is also a good excuse to have a nice cup of coffee. He's not kicking back, he's doing science! Let the man work! That's all for this week, space fans! Stay tuned next week for more pre-launch coverage of the Expedition 45 team, as well as news on the spacefarers who will comprise NASA's first commercially-launched crew! Watch this space! gaze into the oddness of the Richat Structure in the Sahara Desert.